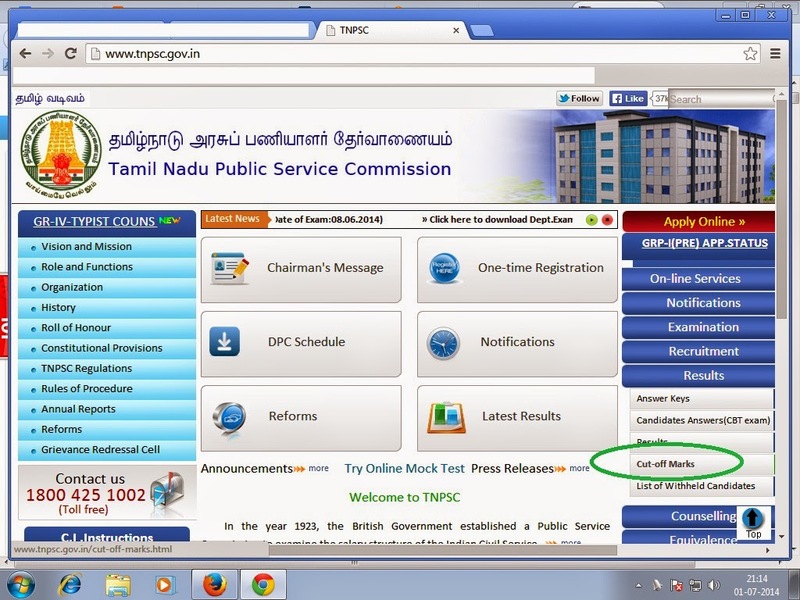 TNPSC ( http://www.tnpsc.gov.in/ ) tamilnadu public service commission successfully conducted tnpscgroup2a cut-off (Non Interview Post Exam) on 29.06.2014. Exam: TNPSC Group 2A Exam - 2014. Nearly 6.32 lakhs candidates applied for this group2a exam. But 30 % of candidates not attend to exam session. Mainly reason is This same date SBI exam, and net exam also conducted. Also this (non interview post only). Tnpsc group IIA combined civil services examination-II (Group-IIA) (Non Interview Post) (Supplementary) exam - 2014 expected cutoff soon we publish. Please note this expected cut-off only a approximate calculation. Surely its not conform. But it will give you a some ideas about group 2a 2014 exam cutoff by community wise. This expected cutoff prepared by some private coaching centers. Note: Soon we upload more Private Coaching Centers Expected Cut Off for TNPSC Group2a Exam - 2014. So Candidates please wait. 2. Click on Results tab. (Its available in Right side bar). 3. Click on Cut-off tab. (If you click result tab - it will automatically publish it). 4. Check your tnpsc group2a official cut off.